Consumer and environmental groups yesterday pleaded with Ohio's high court to end $600 million in subsidies approved by utility regulators more than two years ago to bolster FirstEnergy Corp.'s finances. Not a penny of the surcharge, known as a distribution modernization rider, is being spent to update the local power grid for FirstEnergy's three Ohio utilities, they said. Instead, the money is being used to bolster the company's balance sheet with the expectation that the company will be able to borrow money at a cheaper cost later. Groups challenging the 2016 order by the Public Utilities Commission of Ohio (PUCO) say the payments are illegal under state law. "It is an illegal customer-funded corporate bailout," Kimberly Bojko, an attorney for Ohio consumer groups, told justices during oral arguments. PUCO and FirstEnergy argued the payments will indirectly lead to upgrades of the local power grid by bolstering the utility's credit ratings, enabling it to borrow money in the future at a lower cost. Thomas McNamee, a lawyer for the commission, said grid modernization will cost billions of dollars and FirstEnergy faced the threat of credit rating downgrades at the time the surcharge was approved. "All of these things take money, and unfortunately these utilities are, were, in a bad credit condition," McNamee said. The legal dispute is another thread in a political drama involving FirstEnergy, and one connected to the Trump administration's efforts to bail out struggling coal and nuclear plants. The case began in 2014 with requests by FirstEnergy and AEP Ohio for subsidies to aid money-losing Ohio power plants. PUCO approved a version of the utilities' proposals, requiring utility customers in deregulated Ohio to buy energy from the coal and nuclear plants for the purpose of "stabilizing" electric rates from volatile swings related to natural gas prices (Energywire, April 1, 2016). Consumer groups and competing generators, which argued the subsidies could cost as much as $8 billion over their eight-year terms, successfully challenged the plans at the Federal Energy Regulatory Commission, which blocked PUCO's order from taking effect. Within days, FirstEnergy proposed a scaled-back version of its power plant subsidy plan to avoid FERC jurisdiction. The commission ultimately adopted a counterproposal from PUCO staff to inject FirstEnergy utilities with cash to improve the parent company's finances (Energywire, Oct. 13, 2016). 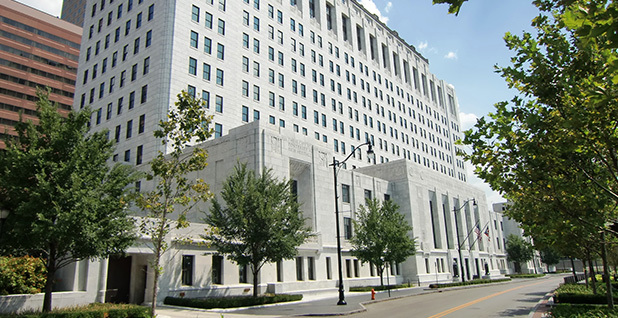 However, groups challenging the plan told Ohio Supreme Court justices that there wasn't adequate evidence in the case record to justify $200 million a year in financial aid with no assurance or requirement that grid investments would come in the future. "Not one penny is required to be spent on distribution," Bojko said. Lawyers challenged PUCO's claim that FirstEnergy was unable to borrow money for grid modernization and that the company would pay hundreds of millions of dollars in higher interest costs to do so. Credit ratings for all three FirstEnergy utilities have remained at least a notch above investment-grade despite the bankruptcy of affiliate FirstEnergy Solutions. Last year, Moody's changed its outlook for the company's credit ratings from "negative" to "positive." Standard & Poor's went further by upgrading the ratings of the utilities and parent company following a court settlement with FirstEnergy Solutions' creditors. FirstEnergy's stock price is up 20 percent since the credit support surcharge was approved, hitting a 52-week high last month. Ohio utilities have further distanced themselves from FirstEnergy Solutions and its struggling generation business since the Chapter 11 filing last spring. Chief Justice Maureen O'Connor questioned lawyers about PUCO's PowerForward grid modernization initiative, how the FirstEnergy payments are related and how the payments made to date might be applied to future work. In August, the commission released a "roadmap" to guide the state's grid modernization efforts. Environmental groups such as the Environmental Defense Fund lauded FirstEnergy's initial $516 million plan even as the parties disputed the legality of the surcharge under court review. Rachel Bloomekatz, a lawyer for a coalition of environmental groups, told justices yesterday that PUCO's grid initiative is unrelated in that it will be paid by customers under a separate surcharge. "What distribution service is this rider helping?" she asked. "The answer is 'none.'" McNamee, however, said the first step to modernizing the grid is ensuring the utilities are healthy enough to borrow money. "You can't have a house without the foundation," he said. Parties challenging the FirstEnergy surcharge include the Ohio Manufacturers' Association, Ohio Energy Group, Ohio Consumers' Counsel, Northeast Ohio Public Energy Council, Ohio Environmental Council, Environmental Defense Fund, Sierra Club and Environmental Policy & Law Center. Akron-based FirstEnergy was not a party to the appeal but was allowed to intervene. James Lang, a company attorney, told justices that PUCO hired an outside monitor to ensure that funds meant to help stabilize the utilities financially are properly spent. That independent monitor has yet to raise any concerns, he said. The FirstEnergy surcharge was approved for a term of three years, meaning the surcharge of about $3 a month for the typical FirstEnergy residential customer will disappear from bills at the end of 2019. The 2016 order, however, left open the possibility that FirstEnergy could reapply to continue the charge for another two years, bringing the total price tag of the subsidy to $1 billion over five years. FirstEnergy spokeswoman Tricia Ingraham said in an email that the company plans to seek a two-year extension of the distribution modernization rider before a Feb. 1 deadline.